242 is a gathering of people who are devoted to praying strategically for Northwest. The name comes from Acts 2:42 which says, "They devoted themselves to the apostle's teaching and to the fellowship, to the breaking of bread and to prayer." There was total devotion to four core values of the early church. The teaching of God's word was primary. 242 will be devoted teachings from the Bible primarily on prayer. 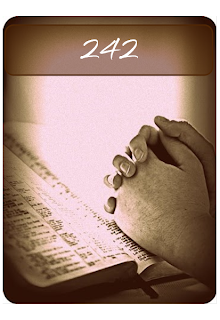 242 will be devoted to the fellowship, coming together as one in unity as we participate in prayer together. 242 will be devoted to the breaking of bread in that there will be times we participate in the Lord's Supper or we may share a love feast together. 242 is all about being devoted to Prayer. We are coming together to be devoted totally to praying strategically for the church, for lost people, for people in the world (10/40 window), for our community and other areas of focus. God still speaks today. His voice and guidance wasn't only for the saints and prophets of old, but for followers of Jesus now. In Whisper: How to Hear the Voice of God, author and pastor Mark Batterson shares seven ways that God communicates with His followers, if they'll stop to listen. Through the tools of Scripture, Doors, Dreams, People, Promptings, and Pain, God weaves divine messages of love, encouragement and insight, into our lives every day.